The evening of November 2 I was in the Sierra de Alvarez, flagging a few points for a trekking practice with the San Luis Potosí group. At 6:00 pm I was on the way back, and about 25 km from the city I got a phone call from Ricardo Sierra (ERM- SLP), informing me of the request of help for the Chiapas Red Cross to rescue two kids that were trapped in a cave near Palenque. Almost immediately after that Ricardo Zaragoza (ERM-SLP) catched up with me on the road, he had gone out to look for me, since he knew where I was and couldn't find me on the phone earlier. 4:30 pm. He informed he everything would be ready to leave at 8:00 pm. With no further information, I stopped at my home to gather my gear and inform ERM and place them on alert/stand-by. rescuers from Red Cross, 1 from Base Draco and 1 from Mexico City's Proteccion Civil. At midnight we started driving towards Villahermosa, Tabasco, where we were informed we would be flown to the rescue site on a PGR (Procuraduria General de la Republica, equivalent to the FBI) helicopter. pick-up truck I was on broke down. I stayed there along with 4 of the crew, we asked for help from the Veracruz Red Cross, while the rest of the group kept on driving to Villahermosa. 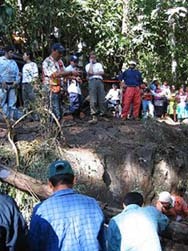 Afterwards I learned that the group decided to drive to Tuxtla Gutiérrez, Chiapas, where they were flown to Palenque by plane and then on helicopter to the rescue site. A Veracruz Red Cross vehicle helped us by towing the truck and at about 2 pm they took us to Palenque on an ambulance, where we arrived at around midnight. From there we drove on the same ambulance to the site, arriving at Jashid (Joshid, Yochib) around 1:00 am. We reported to the command center (set up in a school of the village). We were briefed on the accident. The father and his two kids were hunting tepezcuintles the night of October 31 (Sunday). Their strategy was for the kids and their dog to get the tepezcuintles to run through the south entrance of the cave and the father waited outside the north entrance, his machete ready. That night an animal was only wounded, not killed, and retreated into the cave. Seeing the animal was not coming out the father sent one of the kids looking for it. When his kid didn't come out either, he sent his second son. When in turn he didn't come out, the father went home to look for another of his sons, older. Monday afternoon, the first groups on the scene being ERM-Chiapas, Red Cross of Tuxtla Gutiérrez, San Cristóbal de las Casas and Palenque. set a perimeter for the work zone. This was a difficult task, since there was considerable publicity of the event and one day there were 3000 onlookers. cave, set steps to ease the access to the cave, etc. Their willingness to help was remarkable. In the command center were two Chiapas ERM members: Salvador Rodriguez Pola and Ulises Garcia Zorrilla. They informed us that Chiapas Proteccion Civil was in charge of the operations. That the passage was being widened with hydraulic tools and that the groups were working in 90 min shifts. Since we had plenty of sleep on the road we decided to head to the cave to support the maneuvers and relieve Omar (ERM-SLP), since he had been working for a long time. At the site I was informed they had enough groups to work all night, so I decided to sleep by the entrance of the cave in case they needed extra hands. At the rescue site we found Pemex (Petroleos Mexicanos, the oil company) who had orders to help in any way they could (people, gear, etc). 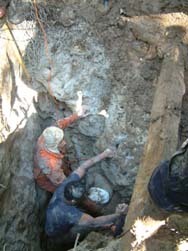 They had geologists, surveryors and drillers, along with heavy machinery. 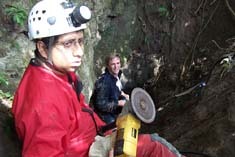 One of the options was to drill a passage, but this option was left as a last resort, given the possibility of collapsing the cave. Another option was to find alternate entrances to the cave. 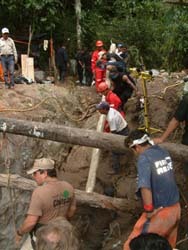 This search was donde with the help of locals, but we didn't find anything that could help us. It is located 500 m from the village. A very muddy path leads to the cave. At 100 m from the cave a stream crosses the road. 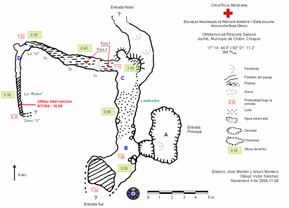 The main entrance is a sinkhole ("A", zone designations, used for the rescue logistics), 7 m deep, easily downclimbed, there you reach "B". To the south there is a room, 3 m of ceiling height (sloping) and a few puddles. Further south there is one of the entrances of the cave. To the north there is a low and wide passage, 60 cm (24 in) high, 8 m long, with a mild slope (5-10 degrees). At the end of this passage there's a room big enough for 5 or 6 persons, seated. On a side there's a small dome, 2 m high, and some small breakdown blocks that lead to another entrance. dimensions and was called "T2", and then "T3" after further reduction of its dimensions. Two light bulbs were placed in T1. At the end of T3 there's a 90 degree turn ("U"), which was impossible to pass except for the shortest and thinnest. 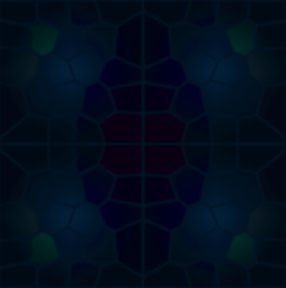 From there, the passage keeps getting narrower. The point of deepest/longest penetration was called "X". The plan was to enlarge the passage. At first we could use hydraulic tools, but as the passage got narrower we had to switch to chisel and hammer and after "U" only the hands could be used, due to the nature of the passage. People would scoop mud with their hands and then inched back to pass the mud and dirt to the ones behind. It was slow and tiring and the closed quarters didn't help. Several of the rescuers said they heard the kids talking, crying and throwing up. Once, thinking they were close to the kids, some food and rehydrating drinks were tossed down the passage, with hopes for them to reach the kids. But as the people advanced they found the food and beverages, intact. In all this time, even when people claimed to hear the voices, there was no visual contact or any other proof. One of the village elders said that we would never find them. "The cave is playing with you", he said. "When you think you're close it will move them and it will keep playing with you... Don't insist much, because the cave could get angry and then it won't let you out. If you want the kids out, you have to trade them for their father. But the cave won't give you both kids, it'll keep one. Let the father go into the cave if he wants to save one of his kids." Several times, when people thought they heard the kids and thought them really close, after gaining a couple more meters there was nothing there. The closest I was was at the second light bulb. I must confess I never heard them, I guess I was not close enough. One of the most tiring aspects of the rescue was the air quality, so we requested equipment to promote air circulation. 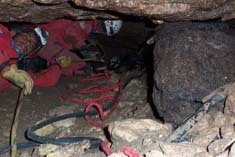 We could only get two air cylinders, which were connected to a hose and used to refresh the air in the cave, but it's clear that this was a short lived solution. According to some accounts, the kids were drinking water which was contaminated with their own urine. Hypothermia was a big concern, but also was dehydration. Two doctors were permanently on duty and their diagnosis was that the kids could still survive for another 48 hrs, but with severe kidney damage. A Villahermosa Red Cross member, Martha, arrived on Thursday morning. She's short and thin (1.47 m, 41 kg/4ft10in, 90 lb). She checked the passage and asked the passage to be enlarged for another 0.6 m more (2 ft). She considered that enough to reach the kids, since she said she could hear them. The group worked hard given this hope. Martha entered the passage again, but she then found another 90 degree turn. At around 9 pm I was in charge of the entrance of the cave. There was nobody else working at that moment since there had been some problems with the locals, who said that all we wanted was the gold that was hidden in the cave. Three locals insisted on entering the cave to see what we were doing. Given the situation I decided to let two of them enter the cave. They confirmed that there was no way on and that there was no gold either. They told me that that's what they wanted to know and that they would tell the community so they would let us work without further hassle. there? We all know the cave and that hole was not there. Mi brother did wrong, a lot of it, and the cave is only taking what it's owed to it. If you offend the owner [the lord of the cave], you have to pay him with what's dearest to you. I believe my brother is paying. What the cave wants is my brother. He must go in if he wants his kids out". We were talking while the rain started. 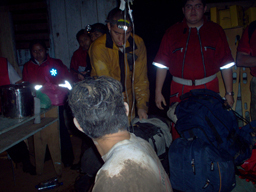 Given the chance of flooding we called everybody out of the cave, and were told to rest until they were called again. Twice I was called to the command center, but the chat was interesting and I said I would be there shortly. Water started to pour into the cave down the slope. We built a small wall to deviate the flow to the southern entrance. We started bailing water out of "B". We had already checked the passage zone and water was not flowing into it. While a group kept bailing water I went in to check the passage up to F2, where I noticed water in the passage. The water level had increased so much that water was starting to come out of the cave. It was until later when I realized that the passage where the kids were was most probably completely flooded, since that level was 1 or 2 meters below "B". The water level kept rising until it reached "B". 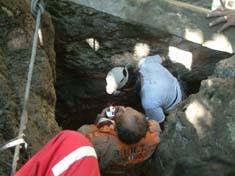 It soon reached knee level, so we climbed out of the cave, since there was nothing else we could do. In less than an hour the cave was completely flooded, up to the main entrance. reporter). Everybody else went home or to their tents. base camp, but the small stream on the way to the cave had grown to 10 m wide and heavy flow. We gave it a try, but the water was very deep and the current very strong. We decided to go back to the cave and wait. 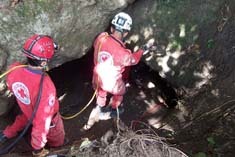 In about 90 min the water level in the cave went down, so we could go down to F2 to check the passage. This was full of mud. Given that it was still raining, we decided to wait until it was completely gone so we could enter the cave and check the changes in the passage. 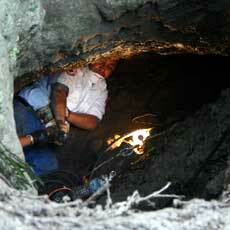 we could cross it now and we found there several members of the Jaguar caving group, from Tuxtla Gutierrez. They had set up a rope and now we were able to cross. In the meantime, a local policeman who speaks Tzeltal relayed information that the village was preparing "something" against the rescue group. They wanted to take one or two hostages until the kids were out alive. Given this, the police insisted on us abandoning the zone. Everybody packed up and somebody was sent to look for me. When I reached the command center, besides giving the latest news, I was only thinking of getting out of my clothes and sleeping a little bit. I was surprised to find everybody awake and ready to leave. I was informed of the villagers' plan and I was not comfortable leaving, since the two locals that checked our work said we could workd peacefully. I guess I was really motivated to stay by being extremely tired and cold, but given the present risk, the small chance the kids had to be alive jumped to a second place, being the first one the well being of everybody involved in the rescue. Cross buildings around 6 am, where we changed clothes and rested for about 2 hrs. In Palenque, after breakfast, we reviewed the whole situation and decided to leave. We drove to Villahermosa City to leave Martha and from there we went to Tuxtla Gutiérrez to be debriefed by the Red Cross. We met there Raul Cano (ERM-Chiapas) and Manuel Hernandez (ERM, Chiapas coordinator) and Jesus Torres Cid (ERM-DF). After hearing the news, Jesus decided to head back to Mexico City the next day. left. It was 9 pm. We arrived at 8 am to Mexico City, where we dropped the locals. After having breakfast at the Proteccion Civil guy, we started driving to San Luis Potosi, where we arrived at 4 pm.